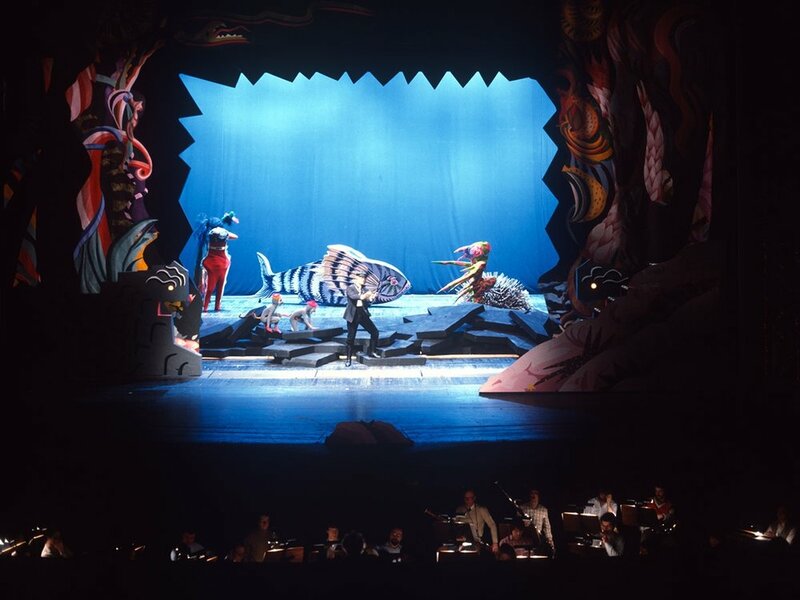 The production of Mozart’s Magic Flute at the State Opera Theater in Weisbaden Germany was the first time animation was used in an opera production. The fire and water sequences used animated paintings projected onto scrims through which the actors passed through. I designed the scenes and costumes to accompany the filmic episodes. My concept for the design was to portray this wonderful opera in a colorful and somewhat cartoon-like manner to mirror the romance of the music and libretto. As the designer and costumer for a production of Berlioz’s The Damnation of Faust at the State Opera Theater in Hamburg Germany we (a group of experimental animators in Boston) created an hour of animation designed to illuminate and broaden the psychological innuendos in the story. Images were projected by 35mm film projectors front and rear and the films appeared and disappeared at various times during the performance. Berlioz’s work was written as an oratorio (singers standing on a stage without scenic design) and does not have a continuing narrative. Thus the use of film created a temporal space in which the aspects of Faust’s demise could be presented in a non-linear fashion.